We’ve been cooking up makeover recipes for well over a decade, and this recipe is by far the most popular with our families and our online community to date. 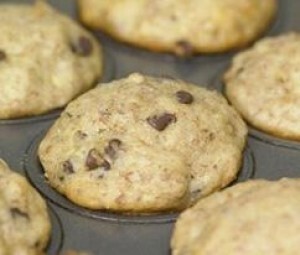 All of our kids grew up making these nutritious little muffins with us. Now that they’re a bit older, they can pretty much make ‘em without an adult hovering over them! SPECIAL OFFER: SchoolFamily.com readers can purchase No Whine With Dinner at 30 percent off the list price, and get free shipping, by ordering the book here and using this promo code: FS2011. Lightly oil or coat 12 muffin cups with nonstick cooking spray and set aside. Whisk together the all-purpose flour, whole wheat flour, wheat germ, baking powder, and salt in a large bowl. Combine the bananas, eggs, sugar, oil, milk, and vanilla in a medium bowl and stir until well blended. Pour the liquid ingredients over the dry ingredients and stir until just moistened. Stir in the chocolate chips. Spoon the batter into the prepared muffin cups. Bake about 20 minutes, or until the muffins are light golden and a toothpick inserted in the center comes out clean. Transfer the pan to a wire rack and cool for 5 minutes. Remove the muffins and cool an additional 5 minutes before serving. To make 24 mini muffins, bake about 14 minutes.